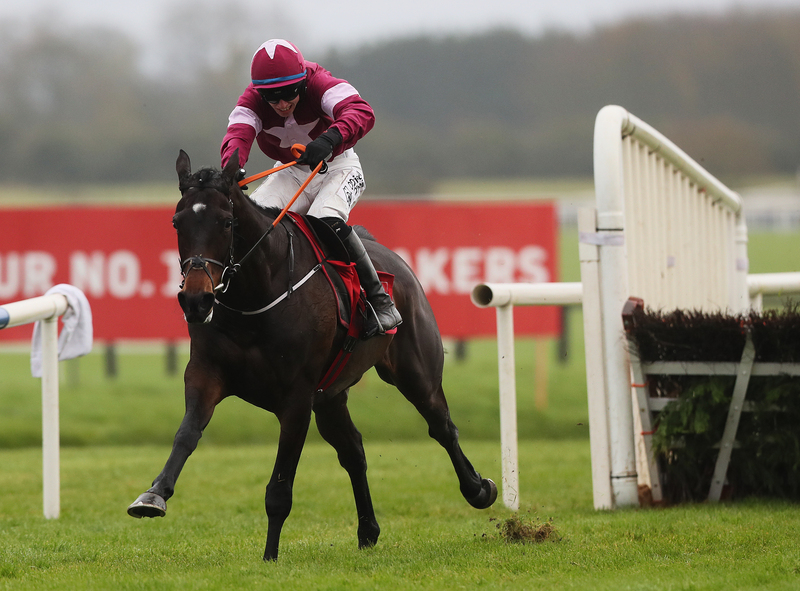 Apple's Jade produced a stunning display to claim her third victory in the baroneracing.com Hatton's Grace Hurdle at Fairyhouse. Gordon Elliott's brilliant mare had claimed the Grade One contest in each of the last two seasons and having warmed up for her hat-trick bid with an impressive comeback victory in the Lismullen Hurdle at Navan - just as she did last year - she was sent off the 4-6 favourite in the hands of Jack Kennedy. Patrick Mullins set out to make it a strong test aboard Wicklow Brave, with Apple's Jade always his nearest pursuer. The pair opened up a healthy advantage over the rest of the field racing down the back straight, before Apple's Jade took over rounding the home turn seemingly still full of running. It was clear at the top of the home straight she had the race in her grasp if she safely negotiated the remaining two obstacles, and she jumped both with aplomb to become the third three-time winner of the Hatton's Grace along with the hugely popular Limestone Lad and Solerina. At the line, she was 20 lengths clear. Last season's Irish Champion Hurdle hero Supasundae was under pressure a long way from home, but boxed on to finish second. Limini fared best of the four-strong Willie Mullins contingent in third under Ruby Walsh. Elliott said: "You are always nervous when you've got something like her running, and when she went down and jumped the last it was a big relief. "Horses like her are what the public want to see and I'm lucky enough to be training her. "Jack said he knew halfway down the back there was plenty there. She loves a fight and is something else. "I'd say she will follow a similar campaign to last year." Apple's Jade is now the general 2-1 favourite for the Mares' Hurdle at Cheltenham, and Elliott added: "You go for the races you think you can win and the easiest race I think is the Mares' Hurdle. "She'll have entries in everything and we'll see what happens."